From lush green spaces, carefully curated retailers, A-grade office space, over 900 car spaces, and leading wellbeing facilities, the range of offerings makes it one of the most desirable locations in the region – a place for everyone and anyone to relax, shop, work, eat and play. North Lakes in the growing Moreton Bay area, is already home to some of the biggest retailers – Ikea, Target, Coles, Dan Murphy and Big W are all under the roof of the newly built Westfield. North Lakes boasts over 8 million shopping centre visits each year annually, with over 5,000 employees being locals. Located just 25 kilometres from Brisbane, it’s quickly becoming one of the most desirable to visit, easily accessed from the CBD and airport. With 80% of the population made up of young couples and families, North Lakes is now home to more than 20,000 people. Where the idea of mixed-use has been re-mixed, Laguna North Lakes offers a one-of-a-kind destination, to one of the fastest growing regions in Australia. Laguna North Lakes provides the opportunity to make a smart investment in this vibrant, growing region. A retail destination unlike any other; shaded green pathways will be dappled with a boutique selection of unique fashion, food and beverage retailers across 5,000 sqm. Laguna provides the opportunity to be part of a unique and profitable retail hub, with a population that earns over $10,000 more than the state average, it is projected that annual spend will reach over $560 million within the next ten years. Grounding the heart of Laguna, 2 towers will provide state-of-the-art office accommodation. Created to the highest environmental standards our office space design is carefully considered to create an inspiring sustainable and healthy workplace. Over 900 car spaces, efficient public transport, and direct links to Brisbane CBD and airports via major motorways provide ease of access for office employees and clients, whilst all precinct retail and lifestyle facilities are at one’s fingertips. At the core of every thriving community, is a central meeting point for people to meet and celebrate. From a quiet dinner, to relaxing poolside amongst landscaped gardens, right through to group celebrations, Laguna is sprinkled with options to suit any occasion. Take in the view at sunset from the rooftop terrace, or opt for an intimate dinner for two at one of the exclusive dining options. Spanning across 3,500 sqm, Laguna’s convention centre will be the largest offering in the community, providing flexible spaces for all types of events. An oasis of health and well-being, Laguna will comprise of a state-of-the-art gym, health and wellness centre, swimming school and lagoon pool. The gym will be positioned across 2,000 sqm where floor-to-ceiling glass wall ensure natural light and a sense of space is felt and enjoyed. 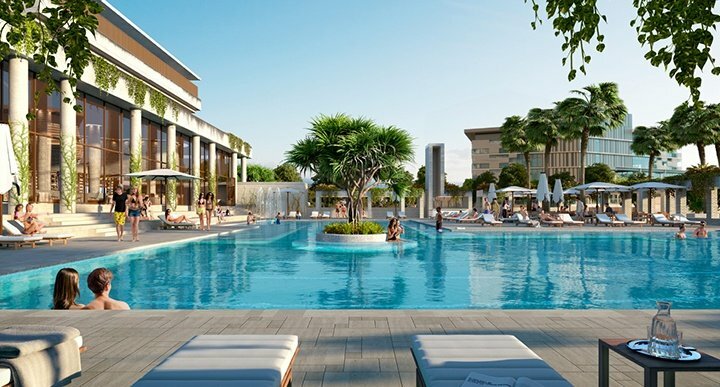 A new concept in lifestyle, office space and retail, Laguna is designed to be extraordinary.